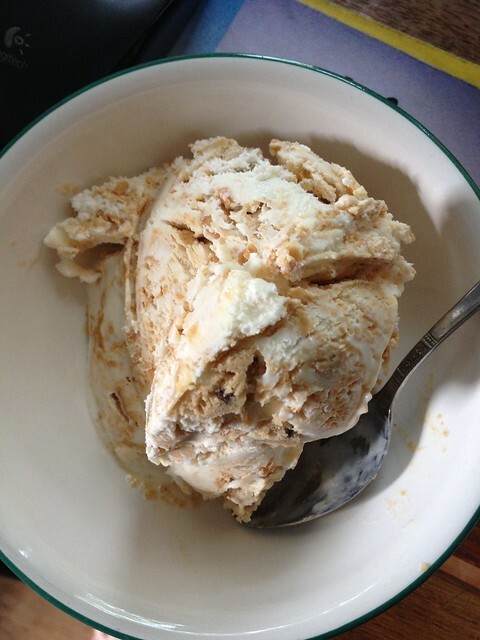 Peanut butter cookie dough ice cream. Where can you get this? Well, you have to go to an Oberweis Dairy store. It's not available from home delivery. I went to Oberweis to get a gift card for some friends who were going through a spate of bad luck. You can get it in quarts. They have to hand pack it in the store. It's not in the ice cream cooler. They also offer chocolate chip cookie dough ice cream, but one taste of this and it's just...oh my. They quit making my all-time favorite, banana chocolate fudge walnut, so I've been forced; forced, I tell you; to figure out what my new all-time favorite is. That's incredibly hard because there are so many good flavors. If I could get this home delivered, this would be it, hands down. I know peanut butter is an acquired taste. I've met a number of people who don't like peanut butter. To each his own. It just means there's more for me. Two spoons way up for this flavor.